This saga begins in Pencil Puddle. Start by obtaining J6's Secret Hideout Map from Sketchy Dragon. Now head to Screen 3 of Crash Site and click on the red button on the boiler to receive the Dwakel Decoder. Equip the map, click on it and select the co-ordinates 342, 197 to travel to the Sandsea Saloon. Walk to the very end of the Saloon and talk to J6 to participate in his quiz. While here, be sure to grab the Crystallized Dragons Breath from the furnace next to J6 as this will be needed later. 1) Where J6 was spotted last? 2) Who saw J6 last? 3) What did J6 steal? 4) What is J6's weapon of choice? 5) What is J6's eye color? 6) What is J6's class? Completion of this quiz will reward you with the Coordinates To Hyperium. Using these co-ordinates, 525, 275, head to Hyperium Starship. At Hyperium, you will need to pass the Defense Turrets on Screen 3. Have two other players ready to press the buttons on Screen 4. The player pressing the button on the right will need the Crystallized Dragon's Breath from the Saloon. When the buttons are pressed at the same time, the turrets will be disabled long enough for you to pass by. Click on J6's pocket to swipe the VR Room Access Card. This is used to access the VR Room on the second floor of the elevator. From here you will begin your first VR Mission: Zephyrus. As you travel through the train carriages, be sure to click the pocket of the conductor on Screen 3 to obtain the Engine Room Key Card. 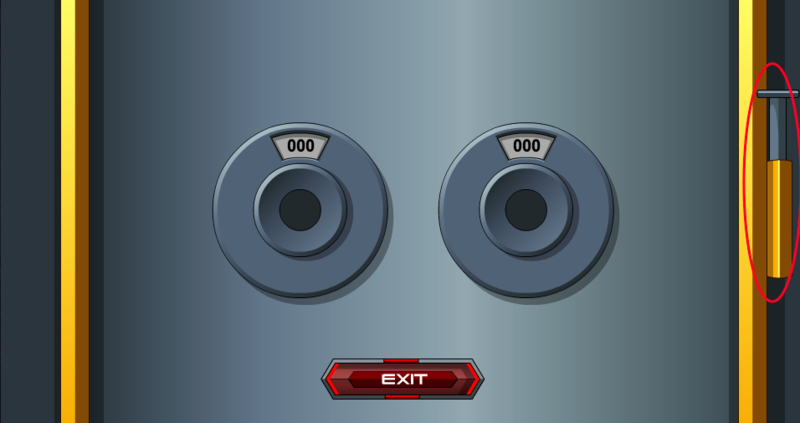 In the Engine Room, click on the furnace door and pull the bolt on the right upwards. Take the Virtual Crystallized Dragon's Breath from inside the furnace, then click on the big steel pipe on the right of the room and turn the wheel clockwise. Continue along the rooftops until you reach J6's ship. Note that after completing this VR mission, Hyperium will appear on the World Map in the Sandsea region. Head back there and travel down the ship's elevator to the lowest level, and click on the big red button to talk to H.A.L..
Incoming message from planet Tipulidae: Bzzz…Urgent need of help! Lizard man creating chaos! Eating soliders. Sugar reserves down! Last seen wearing armor, may have club. Find him and return proof. We pay! Bzzzz. Thanks to Big bang attack and Hina. Telegraph from the people of Xenophobiac: Help us! We've been invaded! Aliens! We've seen aliens! Little green men riding giant metal robots! Help us please! Find the aliens and get rid of them! In the meantime we'll be wrapping our cows in tin foil, heard that keeps the implants out. Thanks to Big bang attack, Hina and Tendou no Mazo. Obtain Datadisk 5 from Femme Cult Worshiper, and take this to the VR Room at Hyperium to access the next mission. Requirements: Must have completed the 'Mission 2' quest. Looks like you're going to have to break your way in by breaking that gate down! Thanks to Aero_Man64 and GM_ francis. Click on the piles of junk around the map. Requirements: Must have completed the 'I'm on the Hunt, I'm after 58-Sr3' quest. Requirements: Must have completed the 'Intruder Alert! Intruder Altert!' quest. Request from Milania: I have an upcoming fashion show. I need your help to hunt a rare item for me. I need some snake scales to decorate a purse. Luckily, I found a breed that drops without the need to kill them. The purse should match the theme of the show. "Obsidian Chic", so get some nice and dark. Thanks to JDraco18 and Tendou no Mazo. Transmission from Prison 955 from Omega Prime: *ckckckck* Call to all bounty hunters, fugitive on the loose. Extremely dangerous. *kssssshhh* Records show the Gr-*message garbled* broke from the hand restraints but there is no indication of leg shackles left behind. He may be armed with a weapon, proceed with caution. Travel to Sewer and click on the disk on Screen 4 to receive Datadisk 4 for the next mission. You must complete 'Mission 4' in order to obtain Datadisk 4. At Banzai, choose the Main Mission option to continue. Complete the J6 & L.O.S.E.Rs mini-game, defeat the 6 Rocket Drones and disarm the bomb by cutting the top-right blue wire. You will now be put into the J6 in Space mini-game. Finish this and head back to Hyperium. Requirements: Must complete the J6 in Space minigame. Call to all. Call to all. Tribequian Emissary requests assistance with exotic material. In search for one elaborate feather. Found on a large cerulean snatcher. Reward for the first hunter who finds one. Thanks to ingomarelementary, Silverwolf_86 and Zero IX. Head to Screen 5 of Time Void and click on the green eye to get Datadisk 3. This next simulation will be terminated early, and only has a cutscene to watch. Requirements: Must have completed the 'Mission 6' quest. Yup. The Hyperium needs fuel for our long trip. And it takes all kinds of oil. Because it's a spaceship. I actually don't know what kind of oil the Hyperium needs. One of these should do the trick. All the other can be used to make funnel cake. Mmm. Now that I'm thinking about food, we are going to need to stock up on some munchies. Yummy. By the way, I've never seen you eat ANYTHING. Do you have an eating problem… or an eating solution? Ever been to space? You will probably get sick. All over the place. You should gather some motion sickness remedies…and a mop just in case. You better not get sick. Or else I'm using your Inventory as a barf bag. We are just about ready--but where IS my pillow?! I'm not going ANYWHERE without my Comfy Pillow. I'm sure it's been lost in The Span of time since I travel all over the place. As soon as you find my Comfy Pillow, we can leave. YAAAAY!! My comfy-womfy pilly-willy pillow! *uh hem* Right. Thanks for finding it. Ready to leave? J6 and yourself will now take off for Hyper Space. Visit the VR Room, where you will be told to go to H.A.L. and play The Memory Challenge mini-game. Choose to spare J6 in the upcoming confrontation, and the next VR mission will be unlocked. Note that siding against J6 will reset your completion for this saga. After finishing the cutscene, go to the VR Room and start Chapter 2. Requirements: Must have completed The Memory Challenge mini-game. You're a superhero, right? Nothing is more super than saving the planet—by recycling! Check the Trashcans and bring me 10 Recyclable Products. Hooray! You really are super, pal! There are some mean bullies who keep beating people up! Won't you teach them a thing or two in manners? Show 8 Bullies the power of proper manners! Will you help me recover the Money for my fundraiser? I went door to door and selflessly asked for Fundraiser Donations, but the thugs and bullies stole all the donations! Yippie! You helped me—so I'll help you! The Boss is hiding at the very end of the Alleyway. Requirements: Must have completed Anita Siztance's Quests. So if wes wants to steal that Spaceship, wes needs to take out surveillance in the area. There be lotsa Robo Guards ‘nd Security Cams yuh can destroy, Boss! Boss, wes started boarding up doors ‘nd windows, but wes tired. Wes no wants anyone to sees us stealin’ that Spaceship, so wes needs yuh to finish the job. Destroy 5 Robo Dogs so theys don’t be sniffin’ around. Youse did it again, Boss! Youse the best ever! Now alls wes need is to find the Spaceship Key! We no knows who has the Key, but wes thinks it be somewhere in this area! Find the Key, Boss! Youse found a key! Is this be the Spaceship Key, maybe? Maybe not… but maybe maybe! Keep yer fingers crossed, Boss! Defeat the Thug Minion when prompted, and watch the final cutscenes. This is the end of J6's saga.